We have been using our IntellBED mattress for 9 years. Read our review and see if you want to Improve Your Sleep Quality with a Non-Toxic IntelliBED Mattress. Sleep is so important. It’s such an important part of our daily life, but it can often be forgotten when you are trying to find solutions to health problems and sleeplessness. My husband and I bought our IntelliBED matteress over 9 years and we still LOVE it. We will never buy any other type of mattress. 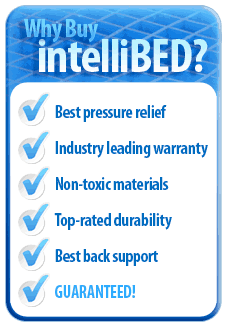 Prior to our IntelliBED mattress we had so many back problems and sleep problems. We currently still have some problems but they are definitely better than they would be. The biggest test is when we don’t sleep on our bed. I can’t sleep nearly as well. 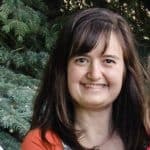 Why Do I Like My intelliBED So Much? 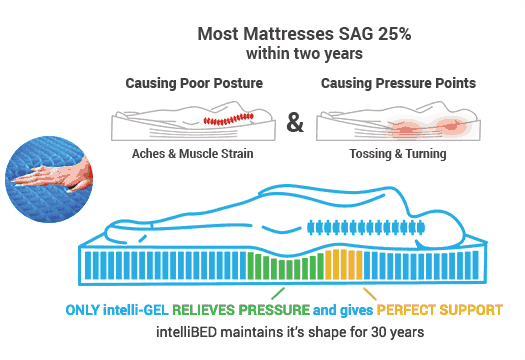 The reason IntelliBED mattress is so good is because your body isn’t flat. You have natural curves. Your curves go down in the bed and the non-curves stay up higher. The difference is most apparent to me when sleeping on my side. When I sleep on a regular bed, my shoulder gets jammed in to my body, often goes numb, wakes me up every hour or so and I wake up sore all over. 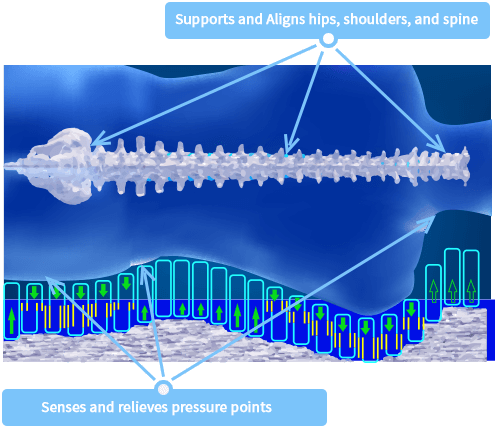 I sleep so much better in my IntelliBED mattress because my shoulder goes down in the bed while my back stays up higher, fully supported, level and aligned. I love my IntelliBED mattress so much and hate sleeping so much in other beds, that I’m going to buy a mattress topper from intelliBED and lug it around whenever I don’t sleep at home so I can actually sleep on trips. I’m so sick of not being able to sleep on trips. It’s a really big problem for me and makes me not want to go anywhere, especially camping. I am going camping at least once this year for a family reunion and our children constantly beg me to go camping. I hate sleeping on air mattress that are cold, lumpy, jumpy and end up flat half the time. I’m done. I’m not going to do it anymore. I’m going to get the mattress topper to bring camping with me and then when I’m not using it for travel, I’m going to put it on my daughter’s bed since I end up sleeping on her horrible mattress more often than I would like to. I think it’s the PERFECT solution! What else do I like about my Intellibed mattress? It’s non-toxic, hypo-allergenic and anti-microbial. I don’t know of any other mainstream bed that is non-toxic. Other beds can off-gas toxic substances all night and you’re just laying there breathing them all night. You can read more here about toxins in mattresses and read the infographic below for more information about the link between autism and toxins. It aligns your spine so you have less back problems and improved posture. I don’t toss & turn nearly as much as with a regular bed. Since there is less pressure on your body and your body is in it’s natural position, you have increased circulation and blood flow. They last a really long time. I’ve had mine for 9 years and I really don’t think it will have a problem lasting 30 years. That saves you TONS of money in the long run. Made with advanced, medical grade materials that are n0t used in other mattresses. I love the Protect-A-Bed Cover on my bed, although I see that now intelliBED has their own gel mattress protector. Sounds like something I need to try. I currently use Protect-A-Bed on all the beds in our house, even the ones that aren’t intelliBED. I love them because they are waterproof and keep dust, dirt and water from getting on your mattress. Otherwise, your mattress can get pounds worth of dust mites in it. That’s just gross and can cause tons of allergies and other health problems. You can call them and they will help you figure out which mattress is right for you. 100% Money Back Guarantee – You can try it in your home for 60 days then return it if you don’t like it.